AR15s and AK47s are legal in California again! Below is an outline of how this is possible using a question then answer format followed by a factual, numbered statement. This information will always be kept up to date. I thought all AR15/AK47 Series firearms were illegal? In 2001, a California Supreme Court Decision (Harrott vs. County of Kings) clarified that SB23 could not ban AR15/AK47s by series, but must ban them by specific make and model number. The CA DOJ used as a reference the Kasler List which specified which firearms were banned. The CA DOJ admitted in 2005 that the Harrott decision was law and that receivers not listed specifically by make and model number in the Kasler List were legal to possess. Further in September 2006, Attorney General Bill Lockyer clearly laid out the legality of these receivers in a letter to Governor Arnold Schwarzenegger as he wrote in support of AB2728. AB2728 passed and became law on January 1, 2007 and the Attorney General no longer has the ability to list AR15/AK47 Series firearms as assault weapons. 1. AR15/AK47 receivers not on the Kasler List are legal and are known as Off List Lowers/Receivers (OLL). What about the ban on flash suppressors, bayonet lugs, pistol grips, and collapsible stocks? Despite OLLs being legal, semi-automatic, centerfire rifles with a detachable magazine cannot have any one of the following features (PC 30515). If your firearm does not have any of these prohibited or “evil” features, then you can have a detachable magazine. Note that bayonet lugs, laser sights, threaded barrels for rifles, nor anything else not listed are not “evil” features and can be used on a detachable magazine rifle. You are also restricted from having. 2.a. Featureless Builds that utilize the MonsterMan Grip are legal. There are even AR15 uppers that are dedictated .22 LR rimfire caliber and those rifles can possess all of the “evil features” you want because they are not a “semi-auto matic centerfire” rifle. 2.b. Rimfire rifles are not covered under PC 30515 and may have detachable magazines and evil features. I don’t want a rifle with those “crazy” looking grips and stocks nor a whimpy .22 LR. What other options do I have? We personally like our MonsterMan Gripped featureless rifles and would recommend at least owning one if you have lawfully possessed large-capacity magazines. However, we also enjoy owning and possessing many fixed magazine rifles as well. If you have a semi-automatic, centerfire rifle that has a magazine that requires the use of a tool to remove, it does not meet the definition of a “detachable magazine” and as a result, the restrictions in PC 30515 do not apply. 3. Rifles that utilize a fixed magazine device like the Bullet Button or Prince50 Magazine Lock Kit can legally utilize flash suppressors, forward pistol grips, pistol grips, collapsible stocks, thumbhole stocks, and/or flare launchers. Here are some examples of “fixed” magazine rifles. Bullet Button equipped rifle with C Products 10/30 10 Round Magazine. 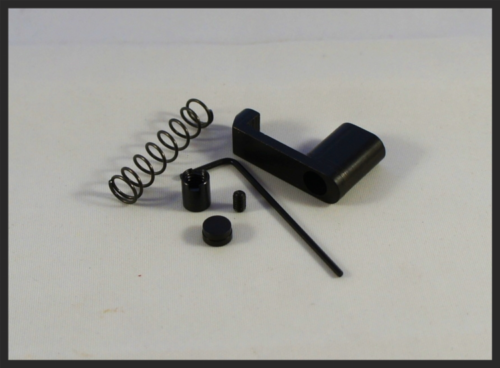 The Bullet Button device installs into a standard AR15 receiver. This device allows for a 10 round magazine to be removed from the rifle with the use of a tool, but not with your hands or fingers. Since it requires a tool every time, it does not meet the definition of a “detachable magazine”. The Prince50 is a standard magazine button that has a second hole drilled through it in order to accomodate a small set screw. When this set screw is tightened into the reciever, it prevents the magazine button from being pushed in. As a result, the magazine cannot be removed. 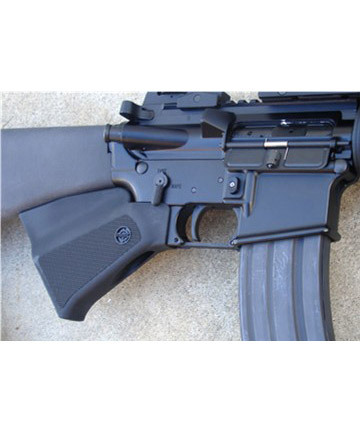 However, you cannot loosen or remove the set screw while there are evil features on the rifle because the button can then be pushed in with your finger, which does not require the use of a tool to remove, making the firearm a “detachable magazine” rifle. The only time the set screw should be removed is when the rifle no longer has any evil features or when removed outside of California. I heard the CA DOJ issued a memo and made the Bullet Button and Prince50 illegal. The California Department of Justice did two things to try and “clarify” the defintion of “capable of accepting” a detachable magazine. First they issued an undated memo stating in their opinion that “semiautomatic centerfire rifles that are modified to be temporarily incapable of accepting detachable magazines, but can be restored to accommodate detachable magazines, are assault weapons if they have any of the features listed in §12276.1(a)(1).” However, there is no basis for this opinion in the law. In fact, Firearms Enthusiast Gene Hoffman wrote the Office of Administrative Law and asked that the CA DOJ stop posting that memo on their website as it was creating “underground regulations”. The CA DOJ has since removed the “Important Notice” from its website. Second the CA DOJ actually submitted proposed changes to CCR 5469 [formerly CCR 978.20] on June 27, 2006. After numerous comments from gun owners, the CA DOJ modified their submission on November 1, 2006. However, they did not submit the change to the Office of Administrative law by June 27, 2007 and the one year submission window closed and the definitions have not changed. 4. The CA DOJ memos are not law nor has the law changed. The definition of a detachable magazine has not changed and the Bullet Button and Prince50 kits do not meet the defintion of a “detachable magazine”. 5. Bullet Button equipped rifles or pistols are no longer fixed magazine rifles or pistols and cannot have any evil features. So what does that leave us? In the next few months the CA DOJ will specify how to register any firearms that you possess that after January 1, 2017 will be assault weapons because of this change or you will have to make the firearm comply with the new definition of a fixed magazine. There are already a few alternatives to the Bullet Button that seem to require the magazine to be removed with disassembly of the firearm action. We will update this FAQ when those are more readily available. For now, your safest legal bet to not register is to go back to having a featureless rifle or a rimfire rifle. AR15 pistols cannot be featureless and will have to utilize the new compliance devices or be registered as assault weapons. What about non-AR15 rifles?These same rules apply to all centerfire detachable magazine rifles. That means if you wanted to buy an off list AK47 receiver or rifle, it would be legal as long as you complied with the assault weapon rules contained in PC 30515. The Harrott vs. County of Kings case was about an AK47, not an AR15. 6. The Harrott decision was about AR/AK series rifles. The same rules apply to AK47s. I heard that Saigas are listed and illegal. If you refer to the Kasler List, you will see that under the Kasler list, the “Kalashnikov USA – Hunter Rifle / Saiga” is a listed AK Series Weapon. However, that is a Kalashnikov USA manufacturered/imported Saiga and not the Russian American Armory made rifle. To help clarify the situation, look at the rest of the Kasler List. You will notice in both sections that the model numbers AK-47, AK47, and AR-15 are listed under several different manufacturers/importers. If it was sufficient to just ban all Saigas, then why did they still list the model numbers AK-47, AK47, and AR-15 by several different manufacturers/importers? The Harrott decision specifically stated that you cannot ban these firearms by series, but they must be banned by specific make and model. If a new company like Stag creates a “Stag – AR-15”, it will not fall under the Kasler List just because there is a “Colt – AR-15”. 7. Russian American Armory Saigas are not specifically listed in the Kasler List and are legal to possess and own in California. Has the California Department of Justice given official approval of any of this? Ever since the first letters originated from the CA DOJ regarding OLLs, a flood of off list receivers and CA compliant rifles have been imported and built in California. No matter what the intentions of those original letters were, the reality is those letters were directly responsible for the importation of legal semi-automatic rifles that the anti-gun lobby would rather law-abiding citizens did not own or possess. As a result, the CA DOJ has all but stopped issuing opinion letters on the legality of any OLL related products. Initially the CA DOJ attempted to modify or “clarify” regulations to limit fixed magazine builds. However, this attempt increased the sales of featureless builds and eventually ended in failure when the time window to officially submit their revisions expired. What liberty minded citizens should know is they do not need permission from their government to exercise their rights and participate in lawful commerce. The DOJ has not approved nor disapproved of any of the fixed magazine devices or alternative grips and stocks. This FAQ was created to give the consumer a clear reference to the penal code and regulations required to remain in compliance with the law. In the end the consumer is responsible for knowing the legality of their purchases and to also ensure that their firearms comply with all federal, state, and local laws. At Ten Percent Firearms we have been lawfully selling and gunsmithing AR15 rifles since December 2005. We are comfortable in exercising our rights and we are also comfortable in defending our actions with law enforcement and if necessary in a court of law. If you have read this FAQ and are not comfortable purchasing AR15 or AK47 rifles, then you should not buy them. If you have read this information and have seen that these firearms are indeed legal, we can help meet all of your California compliant (and most of your out of California) AR15 rifle needs. For more detailed information you can refer to the Bill Wiese California AR/AK Series Assault Weapon FAQ, the new Calguns.net CA Assault Weapon ID Flowchart or contact us here.